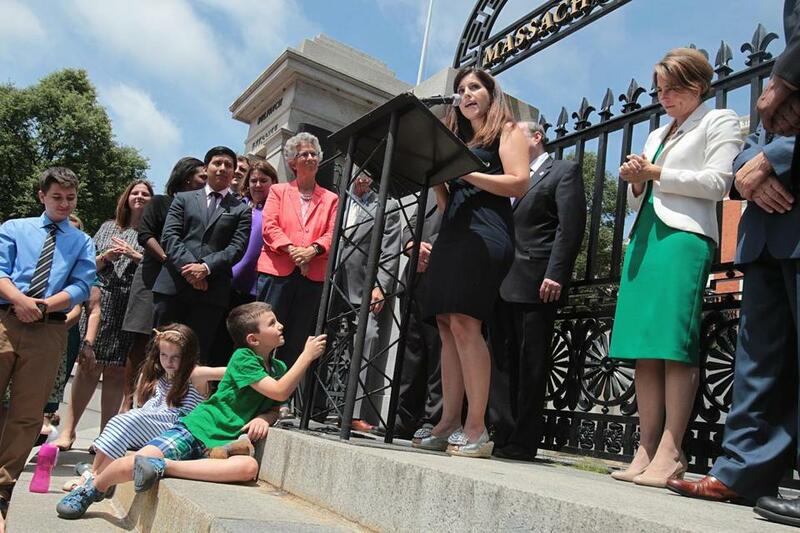 Advocates spoke at the State House in July 2016, after the transgender rights law was signed. One prospective renter was offered a steep discount on an apartment security deposit, from $2,000 to $500. But there was no reduction for a second applicant. The difference between the renters? The one who got inferior treatment was transgender. The other was not. Transgender people frequently encounter disparate treatment while apartment hunting in Greater Boston — even though Massachusetts law prohibits such discrimination, according to a study from Suffolk University Law School that outside analysts said is among the largest projects documenting such bias. The Suffolk team found evidence of discrimination in more than 60 percent of the apartment shopping encounters studied. Researchers found an insidious pattern: what they describe as discrimination with a smile. Applicants who made clear they were transgender generally received pleasant treatment, not realizing they were not offered the same discounts, amenities, and customer service typically given to applicants who are not transgender. “This kind of discrimination is devastating, and it’s happening,” said William Berman, a Suffolk University law professor and director of the school’s Housing Discrimination Testing Program, which conducted the study. Sixty-six volunteers participated in the study, which included visits to 33 apartments in Boston, Cambridge, Somerville, and Quincy between December 2015 and June 2016. The Suffolk researchers used a study design similar to one long used by researchers who analyze housing discrimination against people of color. They selected pairs of volunteers, with each person similar in race, age, economic, and marital status. The only difference between them was the factor the researchers were studying: gender orientation. Transgender renters and those who are gender nonconforming — whose behavior or appearance does not match their gender of birth — were 21 percent less likely to be offered a financial incentive, compared with those who are not transgender, according to the study. Similarly, the transgender and gender nonconforming renters were 27 percent less likely to be shown additional areas of an apartment complex, compared with the other study participants. And they were 9 percent more likely to be quoted a higher rental price. Mason Dunn, executive director of the Massachusetts Transgender Political Coalition, said the study findings underscore something he and other transgender people have long suspected. “What this made me realize, as a trans individual, is that I may have faced housing discrimination in my life, and not known about it,” Dunn said. Dunn said he expects the study findings will prompt transgender people to ask more questions when apartment or house hunting. He hopes they will ask about discounts, additional apartments or houses, and other amenities if they are not readily offered. Jamie Langowski, assistant director of Suffolk’s Housing Discrimination Testing Program and a coauthor of the study, said she hopes the research sends a strong message. Each pair of prospective renters would respond to a randomly selected ad for an apartment. One would meet with the rental agent, then the other. Transgender participants were trained to let the agent know, in as natural a manner as possible, about their gender orientation. For example, they would ask whether a credit or background check would be conducted. If so, they were trained to say that a credit check would reveal a different legal name because the person is transgender and uses a different name. Greg Vasil, chief executive of the Greater Boston Real Estate Board, a trade organization with about 12,000 members including many real estate agents, said he was surprised by the findings. He said real estate agents are required to take continuing education courses that include training about fair housing laws. “This shouldn’t be happening out there, and we should all be working together to find a way to correct this,” Vasil said. The study was paid for by a grant from the US Department of Housing and Urban Development to Boston’s Office of Fair Housing and Equity. Janine Anzalota, director of the fair housing office, said the findings back up anecdotal reports received by her office, which investigates complaints about housing discrimination. Anzalota said transgender people who call her office about discrimination have been reluctant to file a formal complaint, fearing retaliation and further discrimination. She said her office is working to encourage more trust from the community, and to educate people in the real estate market about discrimination laws. Regina Holloway, a study coauthor and a criminal-defense lawyer, said fear of being treated poorly was palpable among the study’s participants. Holloway trained participants so their conversations with real estate agents were as uniform as possible. She debriefed them afterward, collecting information about what was said during each encounter. Massachusetts is one of 19 states that prohibit discrimination because of gender identity, and the Suffolk study is among the largest to document such housing discrimination in a specific state, said Diane Levy, a senior research associate at the Urban Institute, a Washington think tank. But Levy said anecdotal evidence points to widespread problems. A December report from the National Center for Transgender Equality found 23 percent of those surveyed reported housing discrimination because they are transgender. Kay Lazar can be reached at kay.lazar@globe.com . Follow her on Twitter @GlobeKayLazar.